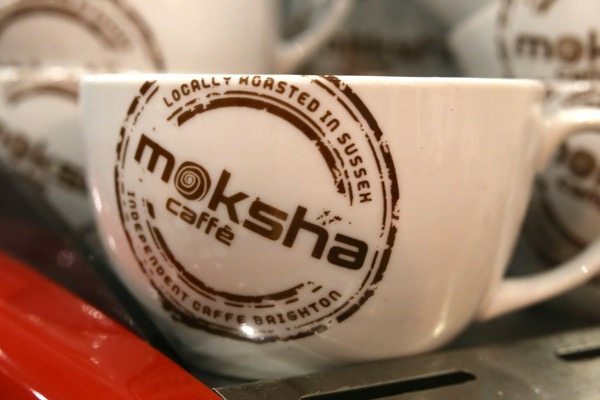 Moksha is an independent, family run café and restaurant on York Place opposite The Level in Brighton that prides itself on locally sourced, good quality food. It is open Monday through to Sunday from 7am to 6pm and serves a great selection of breakfasts and lunches at very reasonable prices; we head along today to check out their burger menu. On arrival, I note Moksha feels spacious – although busy – and has a warm, welcoming tone. The décor is natural, but not too modern, and we are greeted by a wonderful selection of cakes along the counter where hungry punters make their orders. For us this is a whistle stop tour; with only an hour to break for lunch, we would love to relax and soak in the atmosphere with all the other diners, but we haven’t the time. We have called our burger order in already, so take a seat at the back of the café with a black coffee and a fresh mint tea. 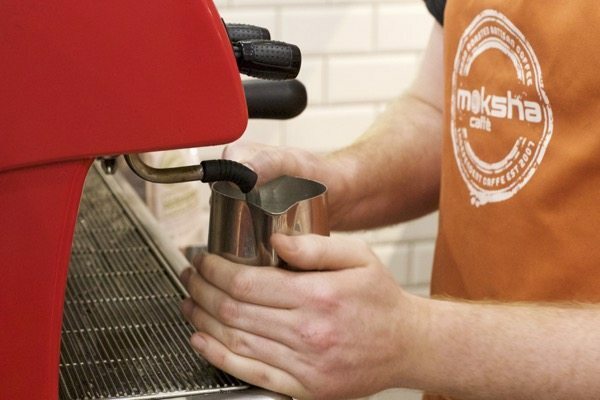 Their artisan coffee is also roasted locally in Littlehampton and in their passion they have created their own Moksha blend, which they describe as having a distinctive, deep and rich taste. Another nice touch to convince you further you are in good hands – they only use organic milk should you take it. No arguments here, Moksha make a great cup of coffee. The fresh mint teas hits the spot too. Served with fresh mint leaves in boiling water, incidentally how my partner and I brew it at home. 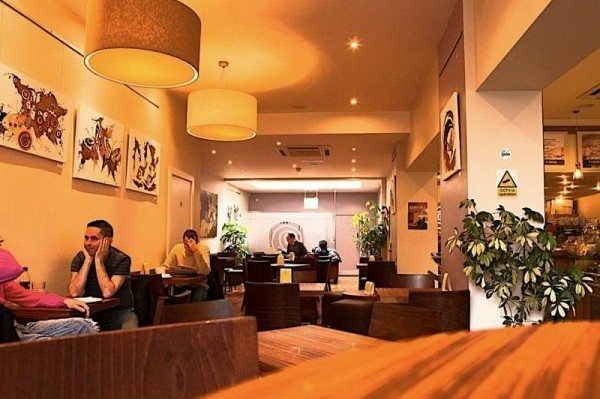 I sense that Moksha is trying to set itself apart from your typical café or coffee shop. The breakfast and lunch menu is thoughtful, with a nice selection of dishes made from good quality, often locally sourced ingredients, all priced from around £5 to £9. At lunchtime they serve burgers and bruschetta rather than sandwiches, but not forgetting the favourites: Chicken Caesar Salad, jackets with various ‘homemade’ toppings, omelettes served with salad and their soup of the day. The menu has an adventurous streak as well. The Huevos Ranchos is breakfast with a Mexican twist (vegan and gluten free option also available) – chorizo sausage, tortilla base, black beans, chipotle sauce – this sounds very interesting. As does the Huevos Benedictos with free range eggs, chorizo, tomato salsa and my all-time favourite breakfast ingredient – avocado. Along with the staples: Eggs Royale, Benedict and Florentine all served with sourdough toast (the only bread to toast in my opinion!) – and the considered ‘Half Breakfast’ for those with smaller appetites, or kids in tow – there is plenty here to entice me back another time. However, today it is all about the burgers. 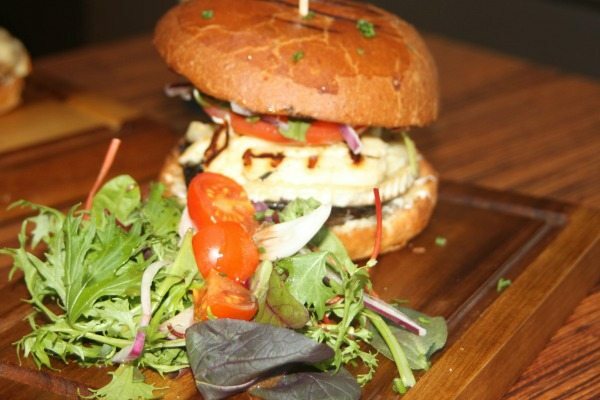 Moksha keep it simple with four burgers to choose from, including one vegetarian option. All burgers are made with 150g of free-range 21 day matured beef, minced and made into pattys just down the road at The Brighton Sausage Company. To compete with all the great burger joints around town, care has to go into the sourcing of the meat. 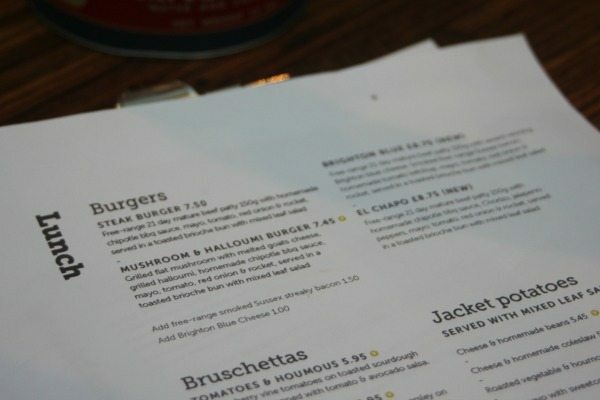 Brightonian Burger Lovers won’t stand for cheap, poor quality meat, because they don’t have to. Chef Oli has clearly taken this into consideration when putting together his burger menu. 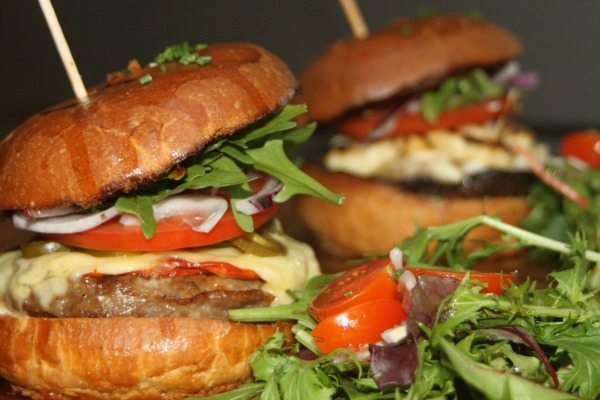 As well as this, all burgers come in brioche buns from The Real Patisserie and are served with a mixed leaf salad. I might have queried the absence fries (or the option to add them should you wish), but as I am in a café, and it is lunchtime, somehow they are not missed. All four burgers sound great, so the decision was not an easy one. The Steak Burger (£7.50) – with homemade chipotle bbq sauce, mayo, tomato, red onion & rocket; The vegetarian Mushroom and Halloumi Burger (£7.45) – grilled flat mushroom with melted goats cheese, grilled halloumi, homemade chipotle bbq sauce, mayo, tomato, red onion & rocket; and the new kids on the block, the Brighton Blue (£8.75) – with award winning Brighton blue cheese, Smoked free-range Sussex bacon, homemade chipotle bbq sauce, mayo, tomato, red onion & rocket; and the El Chapo (£8.75) – with homemade chipotle bbq sauce, Chorizo, jalapeno peppers, mayo, tomato, red onion & rocket. There is also the option of adding free-range smoked Sussex streaky bacon (also supplied by The Brighton Sausage Company) for £1.50 or some Brighton Blue for £1.00 to any of the burgers. We go for the veggie option and an El Chapo for a nice and rounded review. As the Brighton Blue came a very (very) close third, we ask Oli for some of that bacon and award winning blue cheese on the side – well we don’t want to miss out do we? As we have called our order in, the burgers arrive promptly. I don’t like eating in a rush, but we only have about 45 minutes before we are due back at work, and to be honest, I have always found it hard to eat a burger gracefully anyway. It’s something about this kind of ‘naughty’ food; it tastes too good and is frankly too messy to savour. 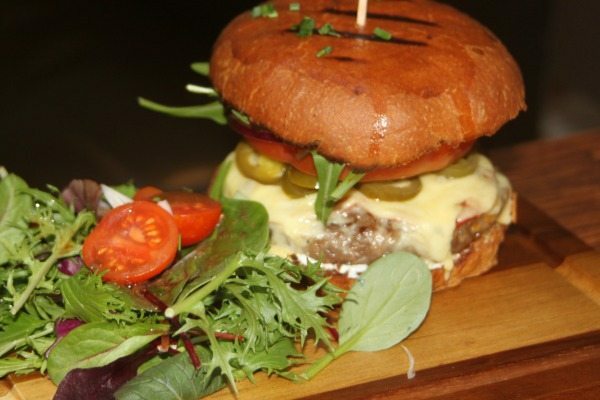 The burgers look glistening and great, both served on a wooden board – almost synonymous with ‘plate’ in relation to burgers. 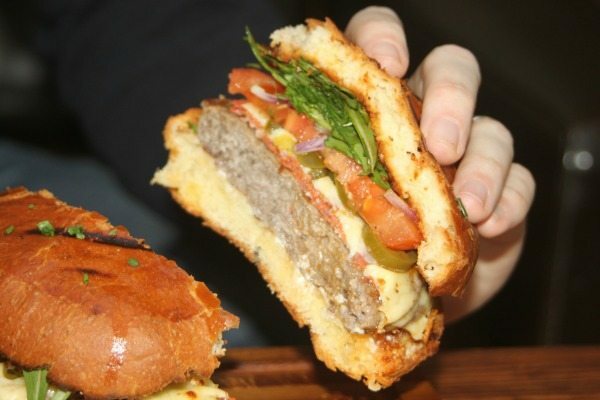 The El Chapo is piled high, with the juicy patty taking pride of place in golden brioche bun. This patty is finely minced, taking on more of a sausage consistency and denser than the popular coarsely minced burgers commonly found these days. This seems more of a traditional style patty, still full of flavour, more peppery, less flaky and sturdier to the bite. The burger holds its own as a result bite after bite, propped up nicely by the addition of the bbq and mayo and balanced out by the tomato, red onion and rocket, adding the needed freshness. The jalapeno peppers add a welcomed kick to the overall combination of flavours. 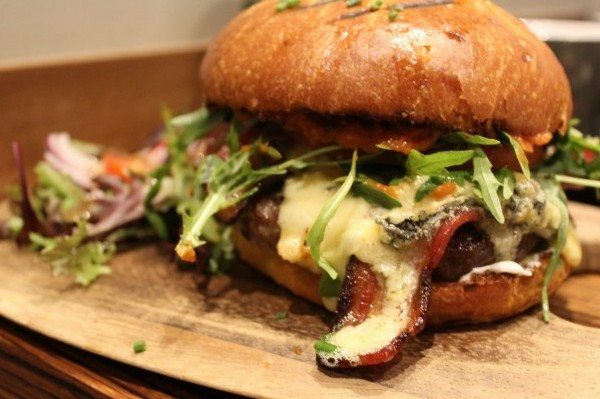 The Mushroom and Halloumi burger is perfectly put together. The goats cheese and halloumi do not argue with each other, but work in harmony, complementing the mushroom – perfectly cooked and moist. Again the addition of bbq sauce and mayo make the burger indulgent and oozing, with the tomato, red onion and rocket adding that zing of freshness. Controversially, if we had to pick a favourite, it would have to be the veggie option – impossible not to enjoy for any lover of cheese! 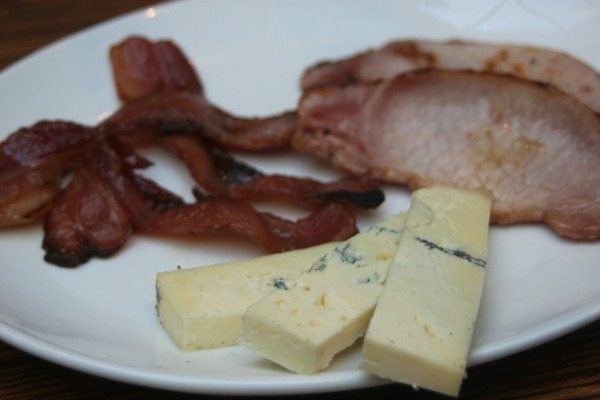 Speaking of lovers of cheese, let’s not forget the plate of Brighton Blue and Smoked free-range Sussex bacon we have been treated to as a ‘side’. This gives us a glimpse of how good the Brighton Blue burger might be in its entirety. Melt in the mouth, creamy blue cheese and lean, meaty bacon. We cannot quite finish the plate of extras we are presented with, but are sufficiently impressed by the quality and flavour of these local ingredients that the Brighton Blue seems like a fairly safe bet, should a second visit to Moksha arise. We finish in the nick of time. With just five minutes of our lunch break left to briskly walk off maybe just a mouthful of burger and get back to the office, we leave marginally overfull, but satisfied. With more time, it would have been nice to savour another cup of that coffee – with a view to kerb the impending food coma – but in the time we had I cannot complain. Oli hands us their ‘specials’ menu as we are heading out. This boasts a ‘morning special’ (£4.95) breakfast deal and ‘weekday burger and drink’ (£9.95) a great value lunchtime deal – one of their burgers with a glass of house wine or beer. So, if you fancy something a little more indulgent than a sandwich for your next lunch out, might I suggest giving a burger a Moksha a try?